The Calendar control displays a one-month calendar and allows users to select a date. You can navigate through days, months and years. Use the Min and Max properties to restrict the selectable dates. 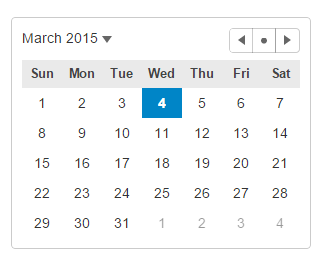 The Calendar control is displayed in the drop-down part of the DatePicker control. FirstDayofWeek : Set its value to a Day that you want to display in the first column of the calendar. Value: Provides the currently selected date by the user. Max: Set its value to restrict range of the latest date that a user can select in the calendar. Min: Set its value to restrict range of the earliest date that a user can select in the calendar. MonthView: Indicates whether the calendar displays a month or a year.